You can be someone other people look up to without being glamorous about it. You don’t need to sell your attitude and accomplishments for the sake of publicity. You can secretly keep being a great role model for each person following your path so he/she can apply the things you share with them enriching their life. No need to become fancy about yourself. Traditionally, these would be fans or admirers or whatever stupidly euphemistic word people come up with. This person following your journey, let’s call him Rick (if you are a guy reading this) and Ashley, if you like to consider yourself female. Rick and Ashely, not necessarily a couple, learn from you because both you give inspiration. In the beginning they will carbon copy you. They will imitate you as much as they can. When you are a painter and you study a masterpiece you try to copy it line by line. Over time, you will develop a tendency to do things. This tendency you will do more often. The more often you lean towards this tendency, you will create a habit. I hear you say. That’s the foundation, the basement for your your „own style“ house. Now, you practice with intention and challenging how you do things. While the 1:1 copy you did before was the basis for what you’re doing now, your tendency and habit will have led to something that looks and feels like you. You are no longer copying this person but adapted what you learned from his execution. You defined your style. Intensify the tendency, make it a habit — which does become the basement of your „own style“ house. Challenge this tendency with deliberate practice. Let the adaption process happen. Adaption complete: You transformed a copied style to your own style. Done. „Own style“ house built. This process can take several weeks up to years. It depends on how demanding and complex the style is you are trying to copy and adapt to make it yours. Oh and, style can also mean lifestyle, style of playing a game (soccer, football) or style of thinking and solving problems. If you let a new style enter your world, you can feel like a fraud, a liar, someone people would not want to trust. Dealing with imposter syndrome? Don’t worry. Me, too. Push through this phase by making progress in the adaption process. You don’t want to be clone all the time, do you? Unless you want to be the clown. Then imitation would be your game. It’s your choice. 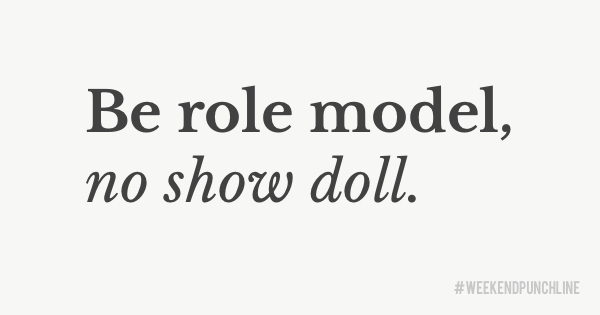 In every case, be aware that your responsibility as a role model is big. The more people consume and absorb you, the more you will see like-minded, carbon-copied people, me-too people. Some will want to stay a copy of your style. Some will develop a style of their own. Don’t be mad when people (try to) copy you. as I learned when I internshipped at the Greenpeace office in New Zealand having created a landing page that the Czech Greenpeace office copied 1:1. Thanks again, Nick! This was episode 15 of the #weekendpunchline . Every Saturday and Sunday.